It’s a bird, it’s a plane, no! It’s Wallace’s Flying Frog! Located in the tropical jungles of Malaysia and Borneo, one of the FEW aerial amphibians on this planet is the Wallace’s Flying Frog. Sizing in at about 4 inches (about the size of a tea-cup), these thrifty and quick frogs annoy and pester their predators. Named after the British naturalist Alfred Russel Wallace (the man who first studied and described these species), this type of frog is known for parachuting almost 50 feet away from its location. Many reasons contribute to why they “fly”. They may be in danger of a predator, looking for prey, trying to mate, or even attempting to lay eggs. Whatever the reason, this amphibian is amongst the largest to do so. After understanding why they “fly”, I was curious to learn how. I had to know the science and physics of its ever-so-unique defense and mating mechanism. When they leap, they spread out their four-webbed feet and catch the air around them. This, coupled with their incredible loose skin flaps, helps them glide, or parachute, through the air effortlessly and smoothly. Their over-sized toe pads help them land smoothly, whether it be on a close tree branch or even the ground. Their flight is quite remarkable, and makes it easy for them to attack their pray (which is mainly insects). If your ever in the tropical jungles of Malaysia or Borneo, look for the frog’s distinct bright green color tagged with a dark black foot webbing. This webbing discerns them from their aerial neighbors. Laman, Tim. “Wallace’s Flying Frog.” Nationalgeographic.com. National Geographic. Web. 22 Sept. 2011. 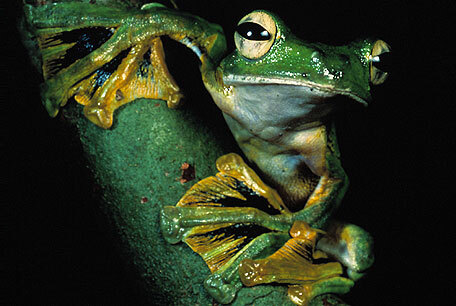 <http://animals.nationalgeographic.com/animals/amphibians/wallaces-flying-frog/>. How do these frogs maintain control while gliding through the air? Also, I thought it found this post to be very interesting. such a small creature could parachute over 50 ft. This *is* the best photo I’ve seen of Wallace’s flying frog. Where is it from? I looked a lot and could not find one so good! I too am curious how they are able to maintain control as they parachute; it seems they must do so at quite some speed! Shalil, when mid-air, the frog spreads its’ limbs above its head, and because it has webbed feet, it parachutes to its destination. If its’ legs were horizontal to its body, and not above, it would be able to glide, similar to what the Javan Gliding Frog does. This parachuting technique gives the frog more time to make decisions and ultimately gives it more control. I also found it to be quite interesting.